Driven by Noel Baldacchino, Swedish Global Oracle won yesterday’s major event at the Marsa Racetrack. This was the President’s Cup final for class Premier trotters on a short distance of 2140m and formed part of the 55th meeting of the season made up of nine races all for trotters. This year the class Premier competition was organised with the support of Technovet. Ten horses lined up for the class Premier final. Quick Fix (Owen Borg) was the fastest horse at first, opening a small lead from I Won’t Dance (Clint Vassallo) and Next To None Sib (Jesmar Gafa’). However when the front horses turned for their final straight, the early leader started to slow down and was overtaken by Global Oracle (Noel Baldacchino) which sealed it first win in Malta from Overtaker By Sib (Marco Refalo) and Drogba Bob (Carl Caruana). I Won’t Dance finished fourth from Lajos Cella (Rodney Gatt). At the end of this final, the President of Malta, H.E. 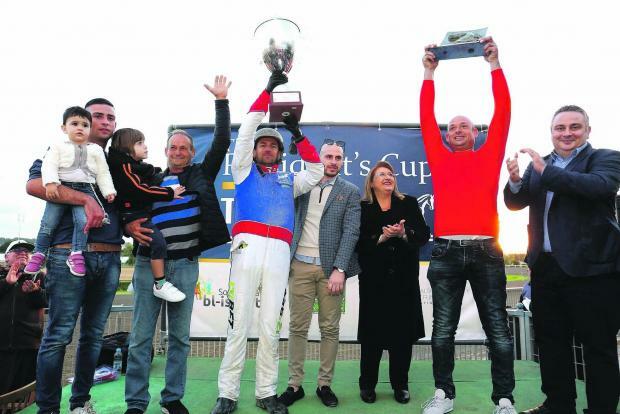 Marie Louise Coleiro Preca, presented the winning trophy to Kevin and Salvu Bartolo and Noel Baldacchino, the owners and driver respectively of the winning horse. This in the presence of Edwin Borg MRC Chairman and Jean Claude Cachia on behalf of the sponsors. In the only class Gold race on the card, French Univers De Suce (Kurt Saliba) increased its pace midway through the final straight and gained its first win in Malta from Sephiro Flam (Charles Camilleri) and Tino De Tortiere (Rodney Gatt). Sam Forget (Nathaniel Barbara) followed behind in that order. Another meeting at the Marsa Racetrack will be held tomorrow. The first race should start at 1pm.